When you ask people what Montsant has to offer beyond wine, you tend to get a very standard group of answers that only vary in the order they are received: almonds, olives, olive oil and hazelnuts. The logic being that the land is so harsh and rugged, with only a few lizards spotting the landscape, nothing other than a few durable and resilient trees can successfully survive in this climate. That said, amazing olive oils, flavorful nuts and diverse and interesting wines blend together in a perfect harmony of flavors within the DO of Montsant. Falset, the capital of the region of Montsant, is only 20 miles from the main seaside city of Tarragona, and therefore, benefits from a culture of fresh fish; while at the same time, it also boasts of Â land based fare such as rabbit and duck. Thus, you have a cuisine of pure flavors, which are presented with only a drizzle of liquid gold olive oil. If you visit Montsant, do not miss the diverse and incredible rice dishes. You many know them as Paella, but they are a far cry from the saffron colored, dried out rice tourist crap you’ll find on many menus in Barcelona and Madrid. Instead, Â you’ll discover rich and decadent dark squid ink rices, with your choice of seafood, wild game or traditional meats. At Quinoa, a trendy restaurant located along the main strip of Falset, Gabriella savored a lobster based rice, that in reality, was more lobster than rice. Half of a lobster was delicately propped on a plate of steaming rice sans lobster utensils. And despite her cocked eyebrow and frustrated grimace as she tried to get at the rich and juicy lobster meat out with her hands, the challenge was met with determination and sounds of utter satisfaction. 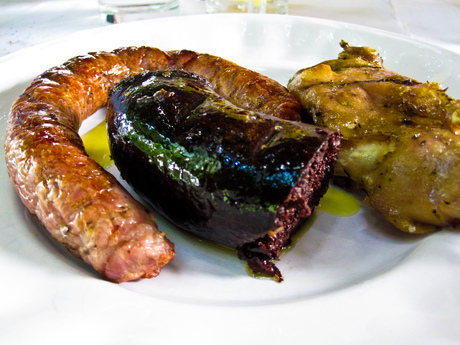 One last dish worth mentioning is called Sanfaina, which is essentially an ode to all vegetarians in the world. I’m not entirely clear if this is always made with the exact same vegetables, but the general idea is to cook down over low heat cubed zucchini, roasted and peeled red pepper, eggplant, onions and garlic in a clay pot coated in oliveÂ oil. With produce being as fresh and flavorful as they are in Spain, especially in rural areas, you can imagine how incredible this particular dish is. As for where to eat? Well, most people we asked, locals and tourism types alike, conceded that there is still a ways to go before Montsant and the Priorat become a restaurant destination. 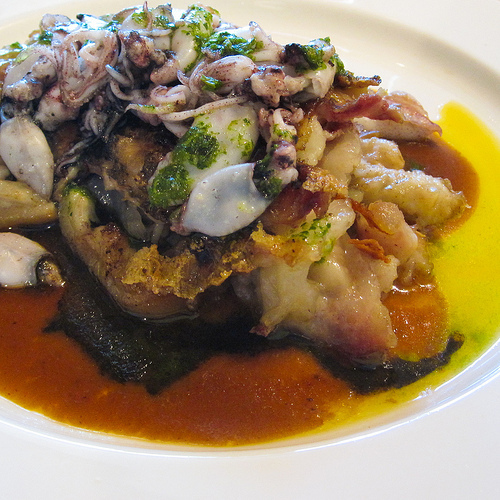 We had meals at both Quinoa and Celler d’Aspic, both of which did not fail to impress. At Cellar d’Aspic we were awed by a cold melon soup with jamon, typical to the region, but the creamy almost honey like texture and flavor wowed us. And while the rice dish of baby squid had us licking our plates, and the roasted pig’s feet covered with baby squid (an odd local juxtaposition, but one I would recommend! 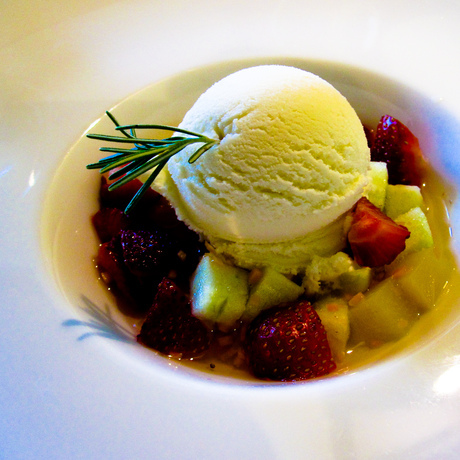 )Â and tenderloin were both done to perfection, it was the rosemary sherbet that made us giddy with excitement. Chef and Sommelier, Toni Bru led us step-by-step throug the meal, complete with a paired wine tasting for each dish, which were generally spot on. One particular favorite was the Finca L’argata 2006. Clocking in at 15+% alcohol, this wine to our astonishment remained elegant and alive with its rich raspberry notes. Our suggestion, quiz Toni on his favorite pairings with whatever food you’re game for and let him guide you accordingly. Matías FernÃ ndez HernÃ ndez owns the popular restaurant Quinoa in Falset, not a stones throw away from Celler d’Aspic. Gabriella with her lobster rice, and I with my duck breast, albeit a touch over cooked, were both noteworthy. Granted, the service needs a bit of a once over, but Quinoa does offer a killer fixed priced menu throughout the week that won’t break the bank. Another great money saver is La Vi-zzeria, an eclectic and funky restaurant in the heart of Falset. Owned by locals who have history in the icecream world, the restaurant boasts of an Italian brick oven to help them crank out some of the heartiest and tastiest pizzas we’ve enjoyed in quite a long time! Don’t fill up on the appetizers and just order from the pizza menu, as you won’t be disappointed. Combine this with an interesting and diverse wine list and a laid back atmosphere, and you’ll be sure to have a good time. Not to mention, you most likely will be sitting next to a table of winemakers while you do it! A few additional jaunts worthy of your attention areÂ Restaurante el Cairat and Fonda la Figuera.Â Both are family run restaurants that are still said to be dishing up the same great fare we enjoyed a few years back. In summary, DO Montsant wines are very rich and dense, but have a natural acidity that is truly breathtaking. With this acidity, we found wines that beautifully match a wide variety of cuisines. White wines with body to take on the richest of meats, and whites with a purity of fruit and freshness on the palate to pair with the most basic of Â salads. If you want to get away from the city and enjoy some fine Catalan cuisine, and good wine, you really can’t do much better than setting up camp in or around Falset, searching out a few local haunts. Or better yet, look for a casa rural with a kitchen and stock up with some DO Montsant wine and local treats.Â A good resource for finding a place to eat can be found on the Comarca’s website. There you can find other places to eat along with suggestions based on price. Let us know what your favorite traditional dishes are from Montsant, or which restaurants you would recommend to others?